Security. Durability. Cost-effective. These are the words you think of when commercial fencing comes to mind. You don’t need the glitz and the glamour. You are not Lady Gaga. You need a fence that will help increase the security of your commercial facility. You need a fence that will stand the test of time. You need a fence that will not cost an arm and a leg to install. You need a Chain Link Fence. For starters, chain link fencing is among the least expensive ways to fence in your property. But don’t confuse cheap fencing and CHEAP fencing. Chain link is anything but low quality. These fences, especially vinyl coated chain link fences, are incredibly durable and built to last, ensuring your property is well protected for a long time. And don’t forget that these fences are easy to maintain. Wood fences require annual staining. Even vinyl fences require cleaning from time to time. Chain link fences, meanwhile, are as close to no maintenance as you can get! Once it is installed, you won’t really need to do much to your new fence to keep it looking its best. A lesser known benefit of chain link fencing is privacy. Yes, privacy! You can install vinyl slats, which are available in a variety of colors, to keep prying eyes away. This is perfect for day care centers, high profile venues, or anywhere where privacy is a concern. And if you are looking to make a statement, custom colors are available to transform your new vinyl coated chain link fence into an aesthetic piece of art. Remember, curb appeal and first impressions do make a difference in some industries. With 40 years of experience, Freedom Fence and Home has provided the highest quality chain link fence installation to its many residential and commercial clients throughout Baltimore. Our fencing experts are available to help you select the right design and materials for your business. 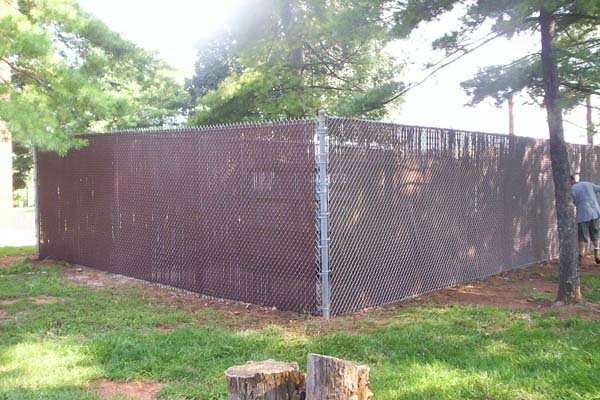 If you have any questions about Chain Link Fence Installation in Baltimore, please contact Freedom Fence and Home by calling 443-271-6841 or visit our website. You can also follow us on Facebook and Twitter! This entry was posted on Thursday, May 8th, 2014	at 4:58 pm	. Both comments and pings are currently closed.